Enter the Day time and press the ENTER button. 1. 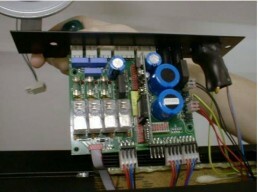 Unscrew the 4 screws on the left side of the control panel and remove the bracket. 2. 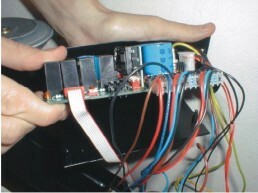 Gently pull the front of the control panel halfway out of the frame, until the battery is fully visible. 3. Disconnect the battery connector and remove the 4 screws retaining the battery. 4. Install the new battery and reassemble in reverse order. 2. Unscrew the phillips-screws from one of the sides and remove the metalbar. 5. 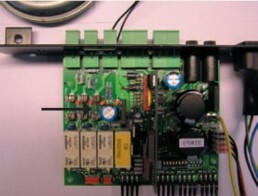 Remove the small 4*4 cm printed circuit board (# 92030000/92030001 ). 7. Connect mains power and turn on the power. 9. If no errors then mount the fronts again. 10. 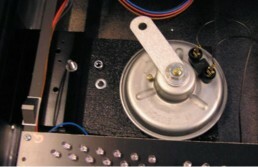 Mount the metalbar and fasten it with the philips-screws. 1. Dismount the screws in one of the sides of the Scoreboard, and remove the metal backet. 2. Remove the Acryl covering the faulty digit. 2. Swtich the DD from the faulty digit, with a DD from a working digit. 3. Turn the Power for the Scoreboard On. 2. 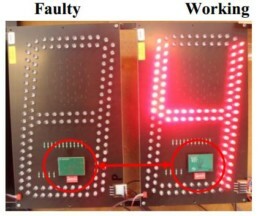 If the faulty Digit is functioning, the DD is damaged, and must be replaced. If the Digit is still faulty, follow the steps below. 2. 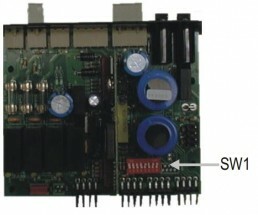 Remove the DD, and clean the Connector in which the DD is placed. 3. 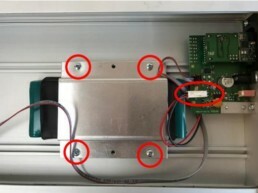 Remove the 4 Pin connector and clean the pins. 4. Reconnect the 4 Pin Connector and the DD. 5. Turn the Power for the Scoreboard on. 6. 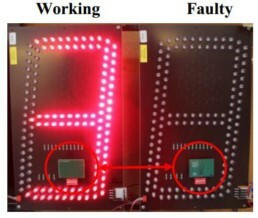 If the error still exists, the Digit is damaged, and must be replaced. 7. Contact the Spare Parts dealer to order a new digit. 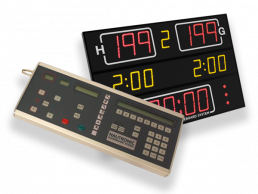 Be sure to have the model type, serial number and information regarding which Digit is damaged ready when ordering. 1. 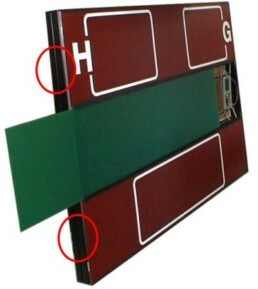 Unscrew the 3 screws in the left side of the scoreboard. Remove the frontplate list. 2. 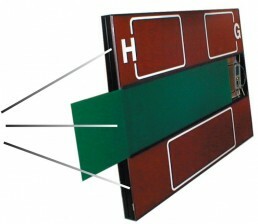 The horn is mostly mounted in the upper scoreboard section (Score). Slide the frontplate to the left to gain access to the horn. 3. Loosen the nut securing the horn and remove the nut and washer. 4. Disconnect the cable shoes and mount the new horn. Assemble the board in reverse order. 3. 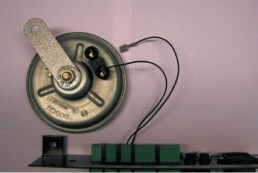 Disconnect the cable shoes and mount the new horn in reverse order. If the defective horn has short circuited, the fuse F3 on the CB is burned. Replace the fuse with a 3.15AT. 3. Slide the acrylic frontplate to the side. 4. Locate the defective display. 5. Unscrew the 4 retaining screws and unplug cables attached to the digit. 6. 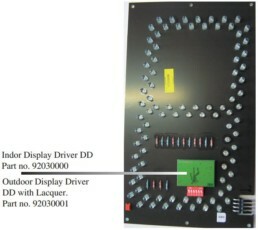 Set the address dipswitch on the new digit as on the defective digit. 7. Mount the new digit using the 4 screws and plug in cables. 8. Connect mains power and turn on the power. 10. If no error occours, mount the fronts again. 11. Mount the metalbar and fasten it using the philips-screws. 1. Disconnect 230V power cable. 2. Loosen the 2 screws. 3. Pull out the print. 5. 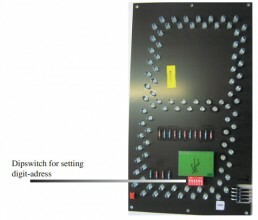 Before you connect cable between the scoreboard and the console, be sure that there is no short-circuit on the cable between the pins. 1. Disconnect 320VAC / 110VAC power cable. 3. Unplug the 5 grey connectors. 4. Pull out the print. 5. 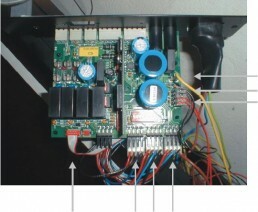 Carefully unplug the wires that are indicated in the picture below. 6. Then squeeze the 4 black plastic holders with a appropriate tool. 7. Set the dipswitch (sw1) on the new print as it as on the broken print. 8. 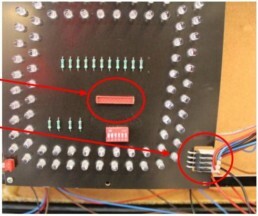 Before you connect cable between the scoreboard and the console, be sure that there is no short-circuit on the cable between the pins.